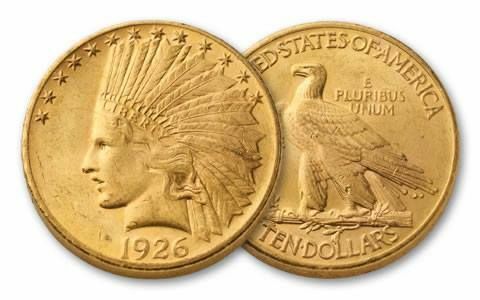 Here's your chance to add this spectacular $10 Gold Indian to your collection. With nearly a half ounce of pure gold content, these Indian Gold coins are the last ever $10 gold coins struck by the mint for circulation. 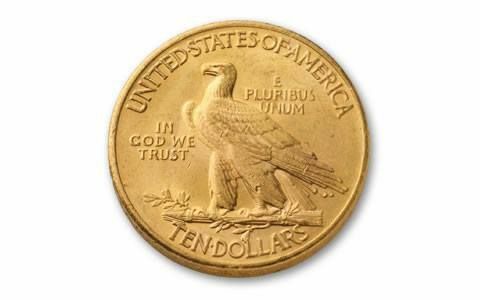 President Theodore Roosevelt proclaimed it to be one of the most beautiful coins minted since the days of ancient Greece and Rome, and when you hold this $10 Gold in your hands, there's no doubt you'll agree with our Rough Rider president. Now you can add this classic vintage Gold Eagle to your collection graded Mint State 62 (MS62) by Numismatic Guaranty Corporation (NGC) or Professional Coin Grading Service (PCGS). Coins Struck Between 1907 and 1933-- You will receive one of the historic coins, the date is our choice. Because they're also heavy, these $10 Gold Indians were easily damaged in transport—nobody really cared at the time. 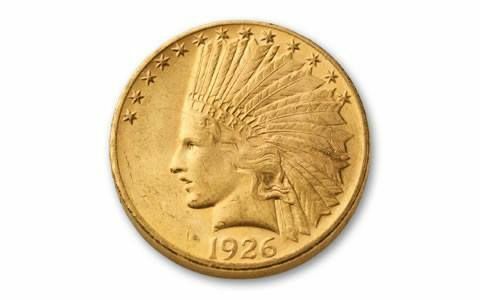 So finding one so close to the condition it was in the day it left the mint makes this $10 Gold Indian coin a real prize, and a great addition to your collection as an individual coin.